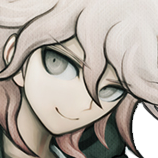 This is where i'll post my sprites because... why not? 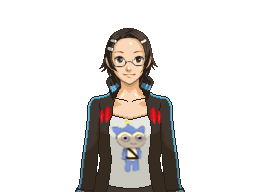 I'm not the best at spriting... but I do hope to improve in the future. 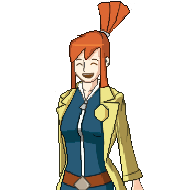 You can request sprites if you want. I dunno if your requests will come out the way you expect it to, but i'll try my hardest! Finished up the rest of his animations, link to album below! Huge album of Kirby sprites! These were requested by a good friend on Ace Attorney Online. DO NOT USE WITHOUT BOTH MY PERMISSION AND MY FRIEND'S PERMISSION. Last edited by DylanNeyaz on Tue Oct 18, 2016 6:58 am, edited 15 times in total. Hey, that looks quite good! 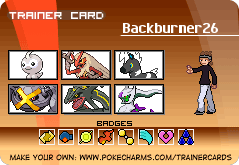 Backburner26. Currently working on Wolfgang Ace attorney, Visit this post here to find out more. Visit my Sprites page! I post regularly and whenever I finish a set that I am working on. Thanks! Your sprites are miles better than this, though, in my opinion. 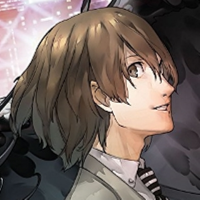 Also, forgot to mention, his body is from his younger self (or "Feenie") and his head is from the profiles. Still, it's pretty good ! I have a problem with the shirt and the tie, though : They look really small, maybe try to widen them a little bit ? I thought he was wide enough... unless he packed on quite a few pounds after what happened during the flashback in 3-1. EDIT: I completely misread your comment... oops. I'll go and widen his shirt and tie. Good job on Phoenix's suit! Can't wait to see more work from you! Last edited by SuperAj3 on Mon Apr 13, 2015 7:23 am, edited 1 time in total. It looks pretty nice. I think you're the 17th one to make an GS1-GS3 Nick Sprite. Also Mij, you misspelt "Can't"
Widened him, his shirt and his tie. Also fixed up some shading kinda. Not so good right now, so many errors and whatnot but i'll fix it. They look great! Is the miles one going to be an old miles in the young miles's suit? If you wish to use them (Which I'm fairly certain nobody will want to) then please ask for permission and credit me. Hey your feenie sprites actually look really good compared to the other sprites I have seen. Keep up the fantastic work! Great work with the Nick sprites! 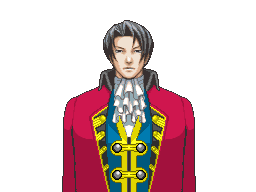 I'm also liking what you've done so far on the Edgeworth sprite! Keep up the good work! Ha ha! I died again! Nice sprites! I don't think you should use young phoenix body for that his young sprites body isn't really upright (I think ) and the suit shouldn't be exactly shaped like a sweater . Isn't there a young edgy profile to use? 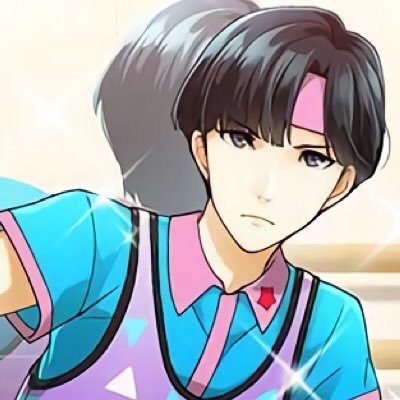 Yes, Young!Edgeworth has a profile pic with his face in the witness position (unlike Young!Mia who has no such profile pic due to being the playable character). Here's a link to it below... (not directly displaying the image here because I'm not supposed to hotlink the CR images). Finished(?) 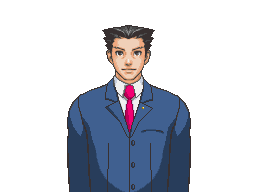 young Edgeworth's witness sprite. These are actually some damn good sprites. Especially, the Young Edgeworth one! It looks good bro, look foward to seeing more from ya! Blinking and talking animations done! For a scratched body, that looks really good! I'm impressed! does his lapel begin that low down on his jacket? Maybe move them a little bit higher. Other than that, nice detailing! They are beautiful! They are such high quality! Its good to have you on the spriting front dude. hope to see more great work from ya. Updated Phoenix to have areas of it more accurate to the sprites, such as the shoulders. 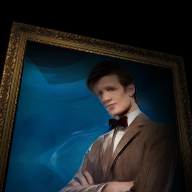 I also improved the shading slightly in some areas. They're adorable! And really well drawn! I love them! Thank you! It took me a while to draw them. Anyway, new frames for Kirby! 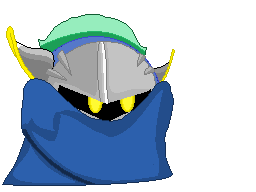 This may or may not mean I am working on another Kirby-related character. Nah, it's alright, I'm already in the process of spriting a startup for that. Okay... I made a startup just for fun, if it's alright with you. Last edited by ApolloRocks23 on Sat Apr 18, 2015 12:55 pm, edited 1 time in total. Whoops! Pressed quote while trying to edit! That's looking awesome! Can't wait to see more! I got an idea! How about Waddle Dee as a Judge? I feel that Maggey doesn't get much love around here... or at least not from what I have seen. 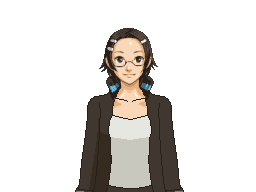 Also, I really like her AAI design, so... yeah. Expect to see Metaknight done soon, too. EDIT: Whoops... double posted... my bad. EDIT: Fixed the size and position of the Blue Badger. 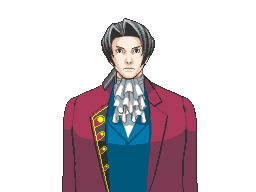 The badger is from normal AAI Maggey's sprite, by the way.